The 991 Series is with us since 2012, with phase 991.2 going official at the 2015 Frankfurt Motor Show. The latest model to join the 991.2 family is the GT3 RS, which has been leaked in all in glory the Australian automotive media. Drive took the article down immediately after publication, but Autoevolution were able to capture the content through Google’s. As expected, the driver-oriented 911 is scheduled to debut at the 2018 Geneva Motor Show, with the configurator going online sometime in February. If it wasn’t obvious enough, the Mamba Green exterior color of the demo vehicle is all-new. Likely the last hurrah of the 991.2, the refreshed GT3 RS borrows goodies from the GT3 and GT2 RS, with the hood boasting two NACA ducts for that go-faster look anyone would expect from an RS-branded 911. Compared to the 500-horsepower GT3, the GT3 RS develops 520 metric horsepower from a naturally aspirated boxer engine displacing 4.0 liters. That’s 20 more horsepower than the pre-facelift, though there’s no word on torque at the present moment. In any case, look forward to at least 460 Nm (339 pound-feet) on full song and the fast-shifting PDK transmission. 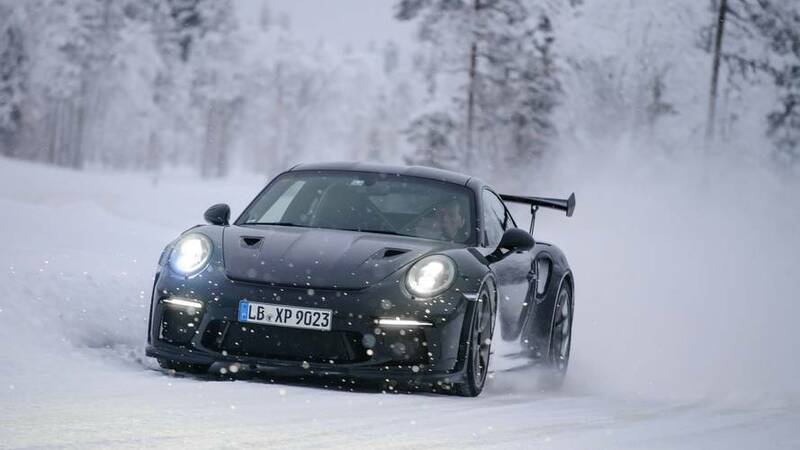 The modifications brought forward by the 991.2 phase translated to quicker acceleration (3.2 seconds to 100 km/h) and increased top speed (312 km/h or 194 mph). If it weren’t for the thumpin’ great rear wing and corner-carving setup, the GT3 RS would’ve been even faster than that. Up front, the 20-inch wheels are wrapped in extremely sticky tires that measure 265/35. The rear is a little more aggressive, boasting 21-inch wheels with 325/30-section rubber. Options? The 2019 Porsche 911 GT3 RS has some of those too, including six-point seat belts and a roll cage. There’s talk of an RS Touring option with a manual transmission and ducktail spoiler, but nothing is official in this regard at the time of writing. It proven true, the RS Touring would be the 911 GT3 RS to have, full stop. Mamba green - unusual but interesting colour. Colour suits it really well, like it better than the Lava Orange. The Merc looked great in the Viper Green but I think the 911 suits it better, think I'll get mine in that colour! Now that is a colour I really like the rear ducts on the p.u as well. It will be a helluva weapon to drive, that much is a given. Porsche just keep on upping their game, very impressive. It's a lean, mean, green machine! I am sure we will need plenty of green to buy this!!! I expected to see the new GT3 at 200K+. That said, it looks to have "flipped out" in the classifieds at circa 180K, with a few sticking around at that? From my reading, I reckon the RS usually commands a 30-40k premium over the non rs. Have had my name on a GT3/GT3RS list for about 2 years. Asked my dealer today how many GT3RS cars he would be getting. Seems to be a maximum of 1 and potentially none. He did say that he had been allocated three 991.1 GT3RS cars. What are my chances? I'm not even in the top 5 on the list, so once again, another excellent car from Porsche, but one that they don't want to sell to me (or a sizeable number of other people). Very limited I'd say, unless you purchase at least 2+ new cars every year. The Porsche Motorsport department is proud to present its latest project at the Geneva Motor Show; the new 911 GT3 RS. Following in the revered tradition of RS (RennSport) derivatives of the 911 coupe, the new model combines a race car chassis and a track-proven, high-revving, naturally-aspirated, four-litre engine to set a new benchmark for performance driving enthusiasts. 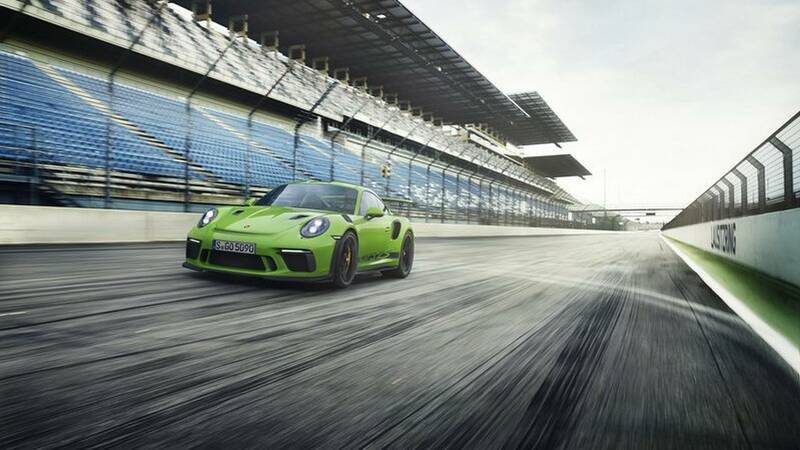 The new sports car from the expert engineers in Weissach, Germany, is based on the 911 GT3, and raises its abilities higher courtesy of a further-optimised, 520 hp (383 kW) rear-mounted, flat-six engine offering acceleration from 0 to 62 mph in 3.2 seconds and a top speed of 193 mph. This is paired with suspension tuned for maximum tactility and precision. 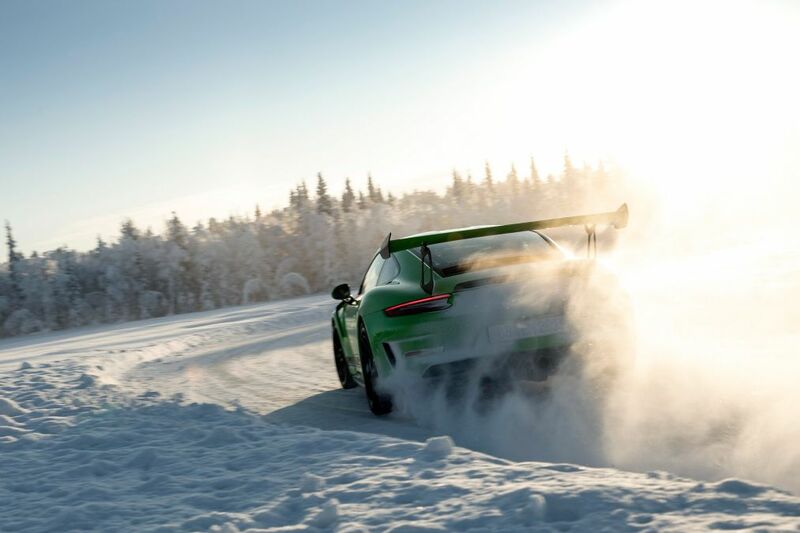 Hence, the 911 GT3 RS features recalibrated rear axle steering and revised suspension for quicker reactions to driver input and enhanced agility overall. Aerodynamics have determined the design of the wide, lightweight body - most obviously with its distinctive rear wing - but detail changes have also been applied throughout the car. The principle of form following function continues inside the cabin, with deeply-sculpted sports seats made of carbon-fibre reinforced plastic (CFRP) with a carbon-weave finish, and which provide secure lateral support through bends. The consistency of the material choices throughout the car emphasise the lightweight RS concept. This is demonstrated by the door panels with storage nets and door opening loops, reduced sound absorption materials and a new, lighter rear engine cover. 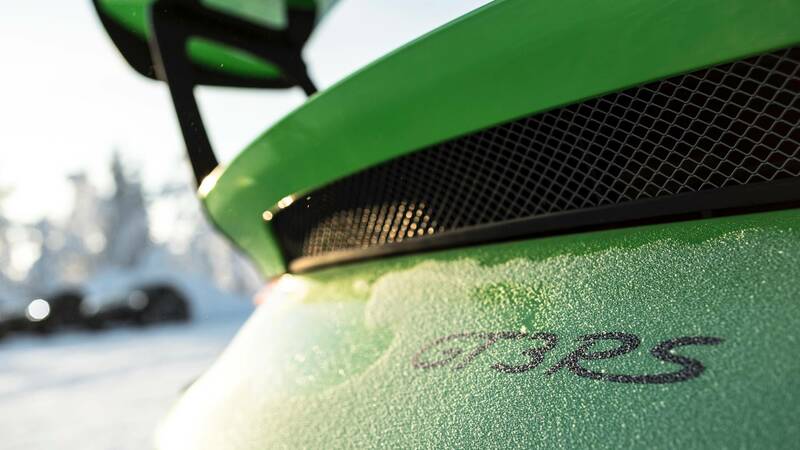 The four-litre, flat-six, naturally-aspirated engine in the new 911 GT3 RS pushes the sports car to new limits, delivering 20 hp (15 kW) more than the power unit in the previous RS model (and also the 911 GT3). Offering an engine rev speed range reaching up to 9,000 rpm, it was the ideal choice as a thoroughbred sports engine. In combination with the specially-calibrated seven-speed Porsche Doppelkupplung (PDK) double-clutch transmission, the focus on high performance guarantees outstanding driving characteristics. Technology straight from motorsport ensures that the chassis provides exceptional responses. Solid ball joints on all suspension arms provide more accurate control compared with conventional elasto-kinematic bearings. Twenty-inch diameter lightweight, forged alloy wheels with newly-developed 265/35 sports tyres on the front axle enhance steering behaviour, while 21-inch diameter wheels with 325/30 tyres at the rear axle improve traction. As with all current 911 GT models, a Clubsport package is also available for the 911 GT3 RS at no extra cost. The package includes a roll-over bar, a manual fire extinguisher, preparation for a battery disconnect switch and a six-point harness on the driver’s seat for a comprehensive track day set-up. For particularly ambitious drivers, the Porsche Motorsport department has created an optional Weissach Package delivering further weight reductions. It features additional carbon-fibre reinforced plastic (CFRP) components for the chassis, interior and exterior, as well as optional magnesium wheels. In its lightest configuration, this package reduces the weight of the 911 GT3 RS to 1,430 kg. NB Availability for the optional Weissach Package is to be confirmed. The new 911 GT3 RS is available to order now from Porsche Centres in the UK and Ireland. The recommended retail price is £141,346.00 inc VAT. First deliveries begin early summer. I was closest at 138k! Of course there’s more power. But this is a Porsche RS, so we’re talking incremental here. 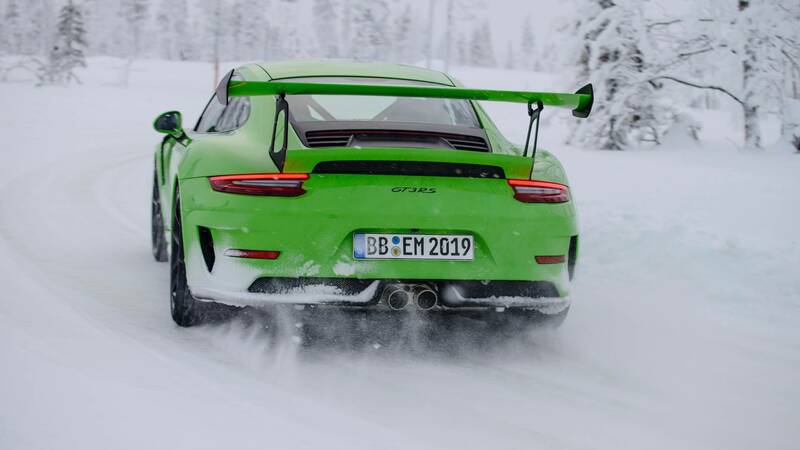 It wouldn’t do that the standard GT3 matches the 500-odd horsepower output of the old GT3 RS, unless the new car increases the stakes even further. So, Porsche has liberated a few more ponies from the 4.0-litre flat-six for a 520bhp ‘maximum’. That’s pretty conservative; Porsche insiders admit it could have homologated a figure more like 530bhp, but the folks there like to be modest. 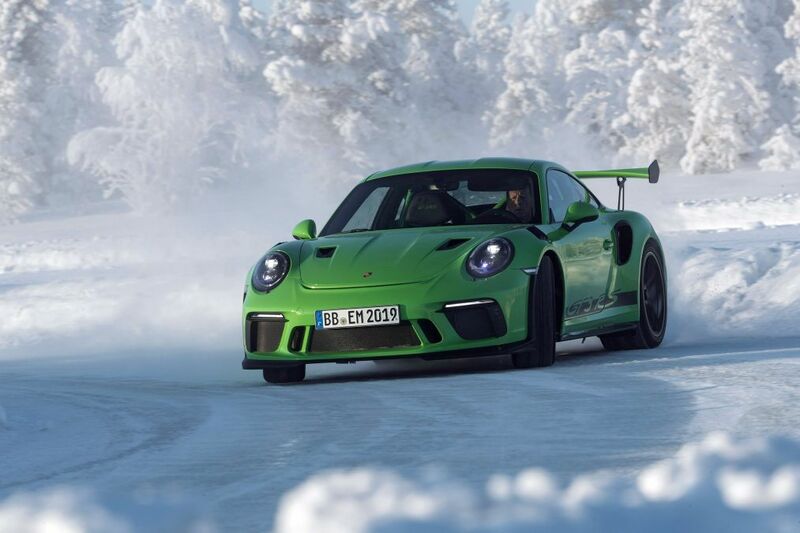 That also means it should be able to produce its quoted 0-62mph time of 3.2 seconds everywhere - whether you’re doing so on a hot desert road in Dubai, or the slip road onto an unrestricted autobahn in the GT3 RS’s motherland. That’s thousand, revs, and again in line with the GT3’s screaming, naturally aspirated flat-six. That’s also 200rpm up on its predecessor. In the back of the RS, it breathes differently over the mere GT3, thanks to the Turbo-derived body’s intakes in front of the rear wheels, while there’s a different exhaust, too. It’s not about power but immediacy, say Porsche’s people, so everything from the breathing, electronics and more has been worked on to make the engine react that little bit quicker. 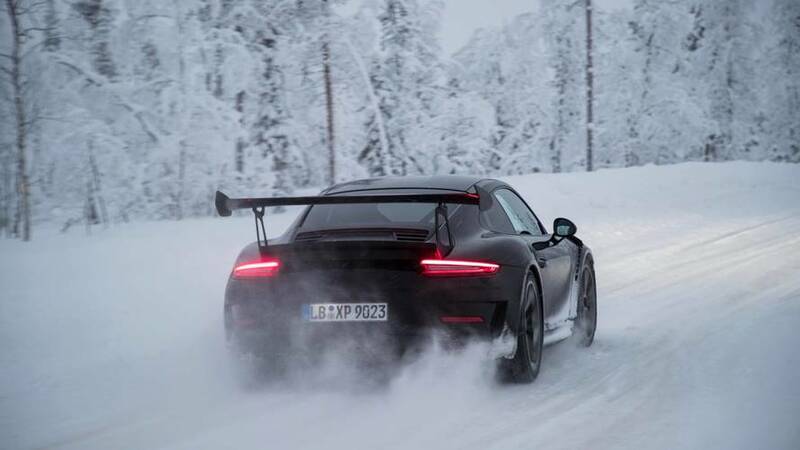 A certain Mr W. Rohrl driving it on a frozen Finnish lake and says us it’s “much better”, and we’re not about to argue the toss with a driving god. It wouldn’t be an RS without some weight savings, after all; the GT department has taken 5kg out of the carpets alone. Thing is, the internet forums will be ablaze with keyboard heroes, as Porsche won’t legally be able to quote its new RS in its very lightest specification, as it has previously. It’ll likely be the same weight as the outgoing car on paper, then - 1420kg, if it’s not ingrained in your RS grey matter reference library - so get ready for some angry internet people. It is all apparently down to a change in the way cars are homologated, something to do with options and percentages of weight. 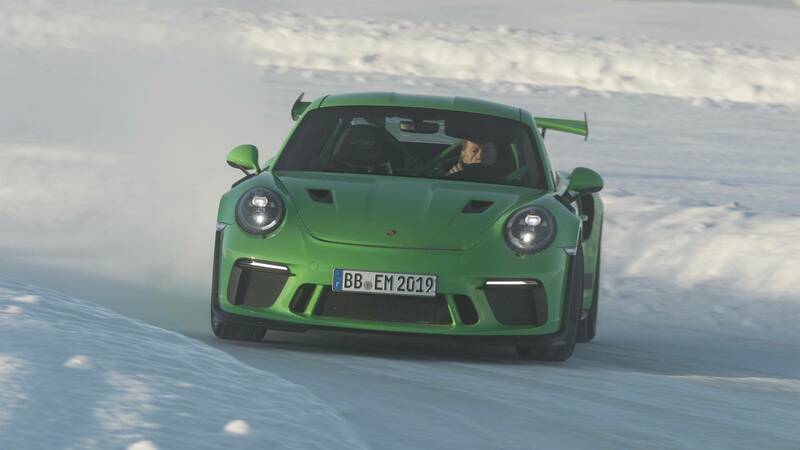 Anyway, if you want a super-light RS, there’ll be the option of the Weissach Pack, as per the GT2 RS, with magnesium wheels, and carbon body parts (the roof and bonnet) combining to help shed around 29kg from the kerbweight and a chunk more from your wallet. Not in the environmental sense, but the colour. 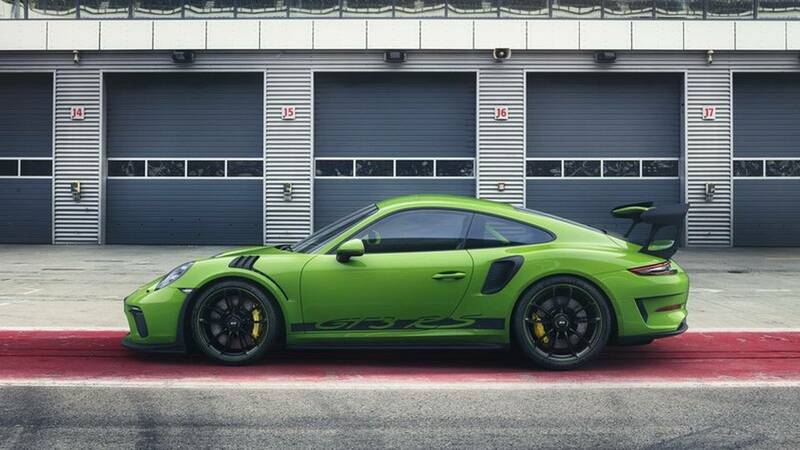 Porsche is calling it Lizard Green. 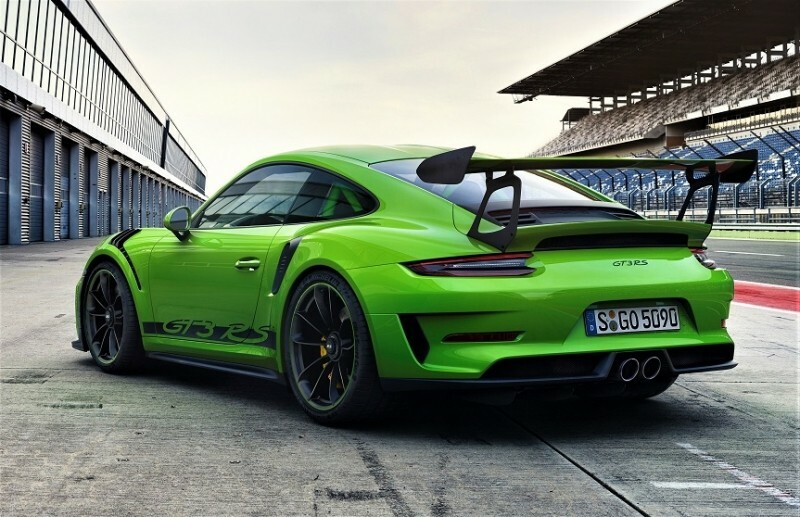 The launch colour of the GT3 RS is the result of GT car boss, Andreas Preuninger, seeing a similarly coloured vintage RS at Rennsport Reunion in the USA a few years ago. Apparently the production team asked if he was crazy, but Porsche has form introducing, or re-evoking, classic colours with the RS - notably Lava Orange and Ultra Violet with the last 911 GT3 RS car. 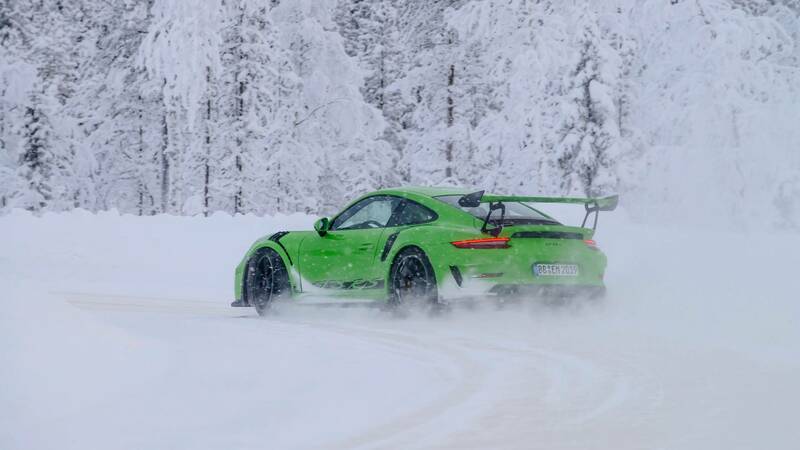 It’s not the first green RS, remember – Viper Green was one of the launch colours of the 997 GT3 RS. Like its 997 predecessor, the new GT3 RS brings back the GT3 RS graphics down the sills, just in case the massive rear spoiler, punctured front wings and channelled bonnet and roof aren’t tell-tales enough. 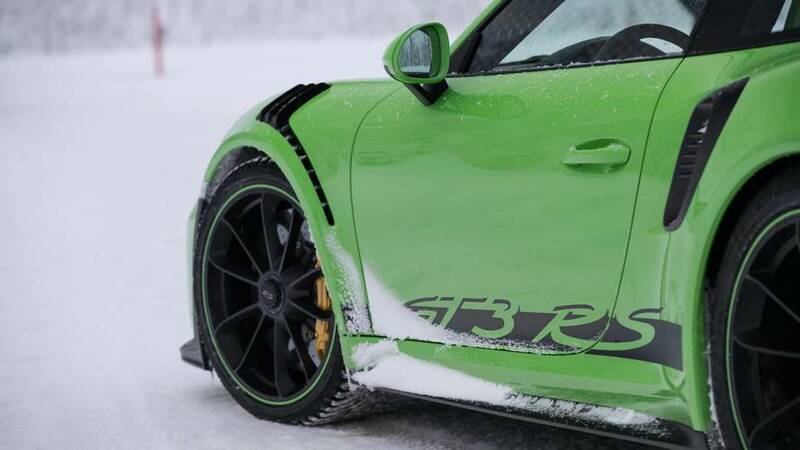 As sure as GT3 RS follows GT3, the new RS will chase its tyre-tracks around the Nürburgring. The standard GT3’s lap time is now 7 minutes 12.7 seconds (better than the old GT3 RS’s 7 min 20 secs) so it has that to beat. 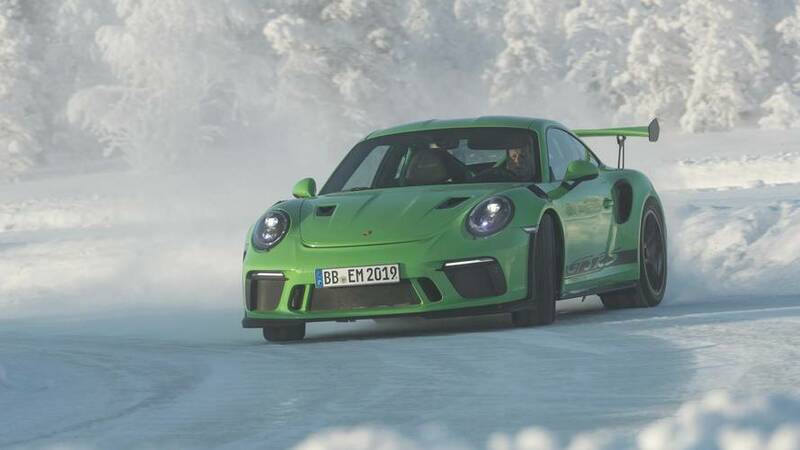 What is certain is it’ll not get close to its turbo-nutter 700hp GT2 RS relation’s bonkers 6 min 47.3 second time, but Andreas Preuninger says: “I think it will end up at 7 minutes 5 seconds or something like that. It’s hugely quick.” Most of that, says the GT boss, is down to the tyre and chassis revisions, only around 1 second or so attributable to the marginally increased output from its engine. Basically the bits underneath are GT2 RS, so that means every joint in the suspension is solid-mounted – bar a single one that’s related to the rear-wheel-steering system. That rear-axle steering itself has been finessed to improve speed and turn-in response at lower speeds, as well as aiding stability at higher ones. The spring and damper rates are all but identical to its big brother, too, and having driven that on UK roads, it achieves a beguiling mix of composure yet authoritative control. It’ll ride even better still if you option that Weissach Package, as the magnesium wheels shave a total of 12.5kg off the unsprung weight. Spend more on the PCCB (i.e. carbon ceramic) brakes too and you’ll drop about the same amount again. True to RS form, the way it exploits the air travelling up, over, around, through and under it has been finessed. The biggest change centres around those new NACA ducts on the bonnet. Again, they’re derived from the GT2 RS, channelling air though the body to help cool the front brakes. That helps airflow under the car too, while also cleaning up the air up and over to the body to the rear wing. Every time Porsche releases a new GT model, it cannot build them quickly enough. That’ll certainly be the case here, with the GT3 RS likely to be over-subscribed. The previous car sold nearly 5,000 units globally, and Porsche is always looking at ways to increase capacity on the 911 line. For UK customers, that’s likely to mean, as with the previous RS, that early customers will have to stick with the standard range of colours, because Porsche’s Paint to Sample option, where they’ll paint it any colour you like, would slow the build process too much. Likewise, delays in production for the magnesium wheels with the Weissach Pack mean it’ll be a two-stage option, with the earliest customers unable to order their car with those lightweight wheels. Yes, as it’s an RS, forget any hope of doing any old-fashioned three-pedal foot and hand work in the stripped and caged interior. There’s always the GT3 Touring for that, or a GT3 without the no-cost PDK option. There is a man in America who had the previous GT3 RS converted to a manual by using a 911R six-speeder, but that’s something that’s unlikely to ever happen again – unless you know any different. Quite simply, the PDK is faster; finger-flipped paddles and seven gears mean that not a lot, short of a hypercar or GT2 RS, will have the capacity to come close on track. 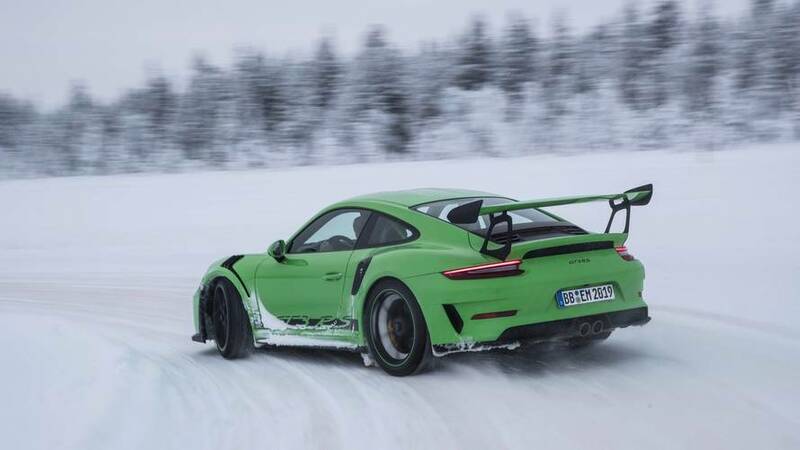 The PDK has, of course, been honed for the new GT3 RS, featuring different bearings inside, while the rear axle ratio differs to compensate for the larger (21-inch) rear wheel and tyre package the RS brings over the standard GT3. He’s been associated with Porsche’s GT division cars since the second-generation 996 GT3, but Andreas Preuninger isn’t what you’d imagine a typical engineer to be. He rides KTM dirt bikes in his spare time (taking the number plates off so dog-walkers can’t serve him up to the law), hand-builds electric guitars and amps with his son, competes in rifle- and pistol-shooting competitions, and has a bright yellow Dodge Ram pick-up with a 5.7-litre Hemi in it that he’s considering supercharging. That’s his “gardening truck”, apparently. Lizard Green is lizard lickin' fantastic!